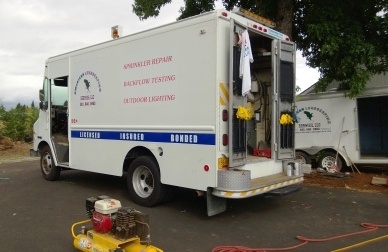 Now offering Certified Backflow Testing and Repair in the Portland Metro Area. 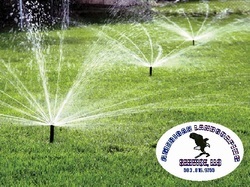 We specialize in water efficiency sprinkler irrigation system for the Portland area. A professional sprinkler system installation will provide maximum water efficiency and will reduce your water bills by applying the right amount of water to your lawn, shrubs and flower beds. Start saving money today by upgrading to an efficient sprinkler system, or by fixing those leaking valves and sprinkler heads. We provide the Portland Area with Irrigation System Design, Sprinkler System Installation, Sprinkler System Repair, Irrigation System Maintenance, Irrigation Winterization, Sprinkler System Start Up & Irrigation System Seasonal Adjustment Services. To ensure a call back from us, please provide us with your Name, Address, Phone Number and a brief message via our Contact form or Voicemail. Thank You and we look forward to hearing from you. Call us from anywhere in the Portland metro area today at 503 816 9755, we are here to help you with all your irrigation needs. Think Safety. Get The Test! Residential lawn sprinkler customers must have their backflow preventers tested annually. *Note: The above rate is for testing a residential backflow preventer located outside your home and accessible to our technicians. Additional Charges will apply to devices without test ports, inaccessible devices, and devices that fail the test and are in need of service repair. Call or Click on the request a test link and provide your complete contact information. A licensed technician will test your backflow preventer within 5 business days. Your invoice and a copy of test results will be place at your front door, E-mailed or mailed when the test is complete. Official back flow test results will be forwarded to your water company upon receipt of your payment. We use County approved procedures to provide HONEST tests to insure that your backflow prevention device meets the required standards. Backflow prevention devices are designed to maintain water quality by keeping pollutants and contaminates from entering the drinking water supply. Water Districts are required by the EPA and the State of Oregon to implement a Backflow, Cross Connection Control Program. Some examples of pollutants and contaminates are irrigation water, pesticides, cleaning agents, water conditioners for boilers, X-ray developer, fire supply lines, etc. We help reduce your liability by making sure your irrigation backflow device is working properly. We work on all approved devices and can replace any obsolete backflow device with one that is on the most current approved list. Backflow Testing using gauges calibrated as required by the water agencies. Backflow Repair of devices that do not pass the initial test using approved parts. Backflow Replacement of obsolete devices with current approved devices. Backflow Removal of devices that are no longer in use and certifying the removal to the water agency. How often do backflows get tested? A. Backflow Prevention Device must be tested each year on a designated schedule or whenever a Device is moved or repaired. On the yearly schedule, your water purveyor will send a notice of required yearly testing to the water bill account holder, who is responsible to pay for and to ensure the test is completed. A licensed Backflow Tester will test the Device and send the required report to your water purveyor. A copy of the report will also be given to the customer by the licensed Tester at the completion of the test for customer’s records.